British music legend Phil Collins is coming to Lyon’s Groupama stadium. The star will perform a one-off concert on 4th June 2019. Get your tickets this week! 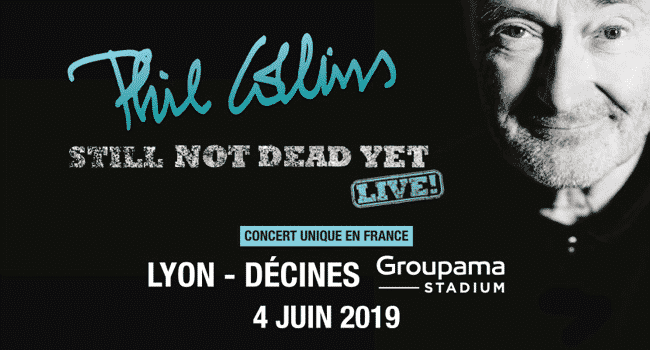 Collins humorously named tour – Still Not Dead Yet – will see Collins visiting many cities, and Lyon has made the list as the only stop in France! Collin’s return to touring during his retirement is testament to his commitment to performing and love of music. Collins has sold over 100 million records worldwide. Collin’s biggest hits include songs such as ‘In the Air Tonight’, ‘You Can’t Hurry Love’ and ‘Two Hearts’. Tickets vary in price between 67.50€ and 166.50€. Tickets will go on pre-sale on 28th and 29th November 2018 on Ticketmaster and Groupama Stadium's website. General release tickets will be on sale on November 30th from 10am.